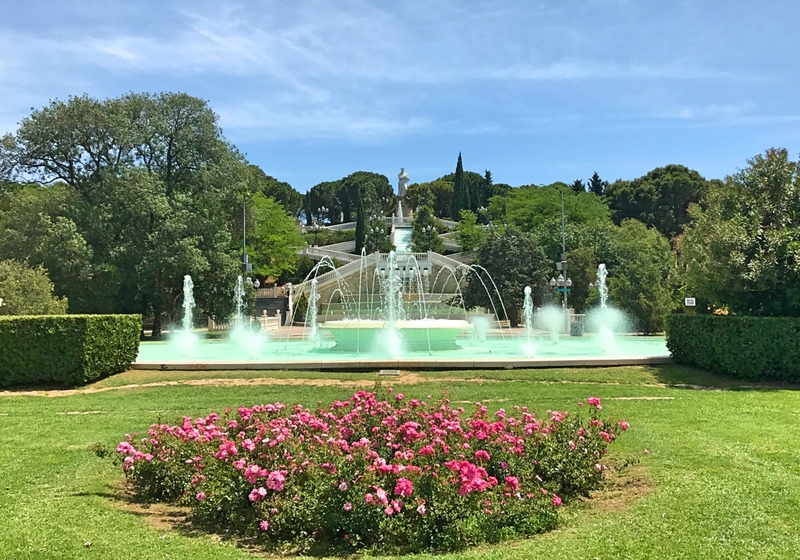 The first thing I took note of in Zaragoza was as we were walking from the train station to our hotel and passed Caesar Augustus Square. 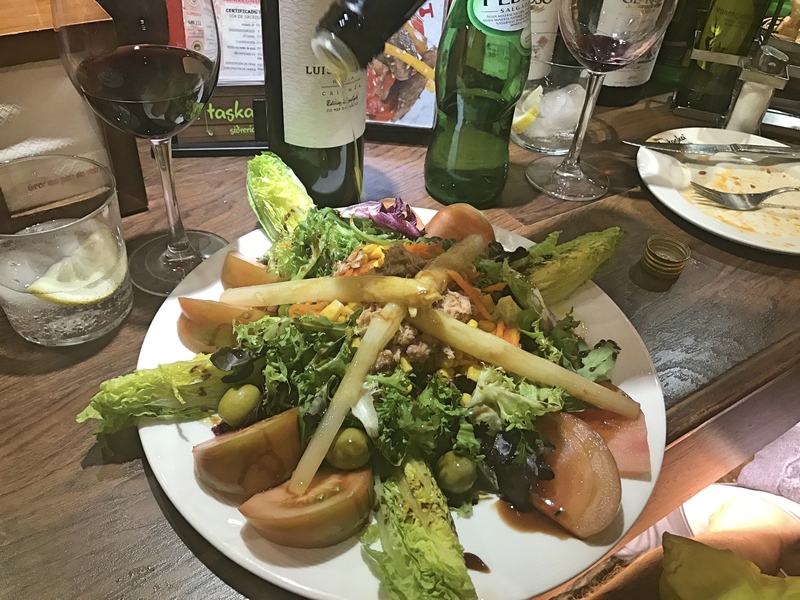 Mark observed that the city was founded during the reign of Augustus and in fact was originally named “Caesaraugusta” which, if you say it enough times becomes “Zaragoza” or, as it was known in English for many years, Saragossa. The city sits on the Ebro River, a favorite for crossword puzzle writers, and is today Spain’s fifth largest city. Over the centuries the Romans, Moors, and Spaniards all left their distinctive marks. We really enjoyed the city; though there was nothing explosively fabulous about it and we didn’t exactly start looking at real estate, it just had a great feel to it. There were lots of really attractive little plazas where for a couple bucks you could sit with coffee or sparkling water, read, and just watch a very pleasant life go by. Here are some of Zaragoza’s hits and misses. The first big site is the Basílica de Nuestra Señora del Pilar, the Basilica of our Lady of the Pilar. The story, though I’m modestly skeptical, is that soon after the crucifixion (January 2, 40 AD to be precise) the apostle James was preaching in Spain, frustrated by his lack of progress. As he was deep in prayers by the Ebro River Mary – who was still very much alive – appeared, having been carried by angels to Spain. She told James to hang in there (or something to that effect) and gave him a pillar around which he was to build a church in her honor. 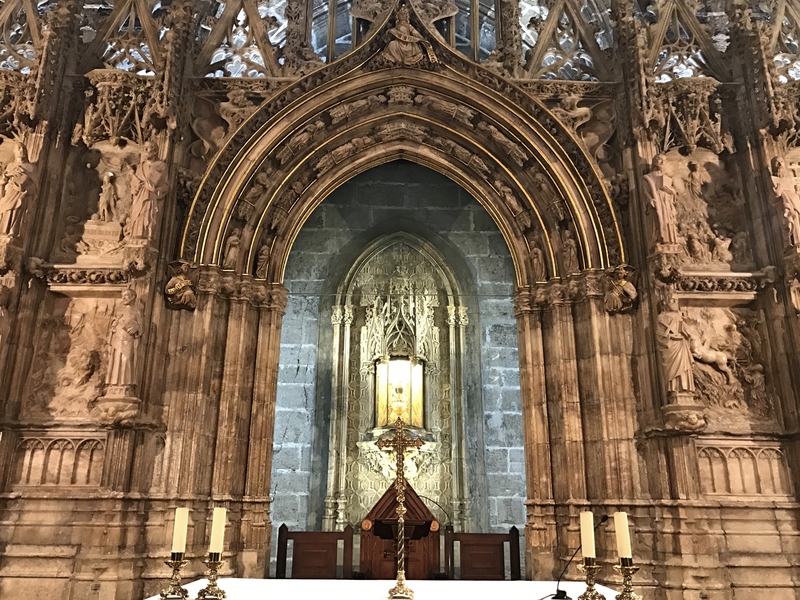 According to legend that very pillar is still a part of the church, purportedly the first church in all of Christendom to be dedicated to Mary. Now, admittedly I’m a skeptic, but the church itself is stunning. The current building dates from the 17th and 18th centuries in the Baroque style, but the exterior, with its huge dome and 10 smaller tiled domes has a distinctly Byzantine feel to it. 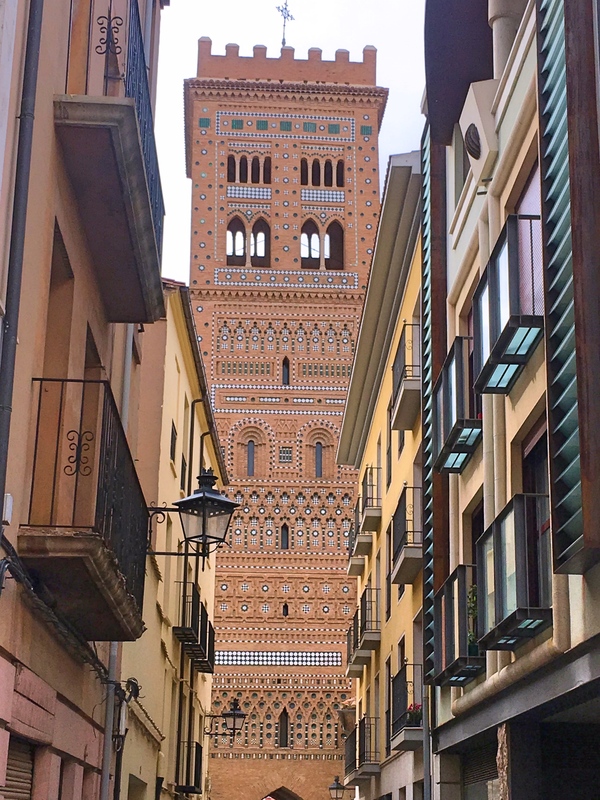 Not only is the view from street level wonderful, you can take and elevator part way up one of the towers and then climb the rest of the way for great views across the city. A site not to be missed. Next on the list, and surprisingly close, is La Seo, the Cathedral. Why you need a second huge Catholic church almost literally a stone’s throw away from the Basilica is another of those mysteries, but there it is. 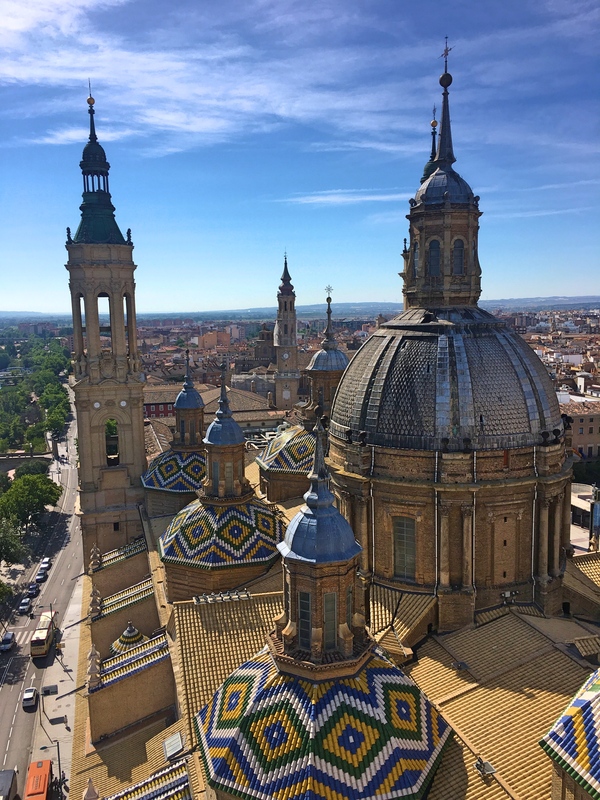 On the site of what was once Zaragoza’s main mosque – itself built on the onetime site of a Roman temple – the Cathedral dates from the 12th century, though extensive changes have been made over the centuries giving it quite a mishmash of architectural styles. Along with other buildings throughout Aragon, La Seo is part of the UNESCO Mudéjar Architecture of Aragon World Heritage site. A third major site in Zaragoza is the Aljafería Place, built originally for the region’s Islamic rulers and later converted for use by the Catholic Monarchs, Ferdinand & Isabella. Another part of UNESCO’s Mudéjar World Heritage site, it is one of the oldest and largest remaining pieces of Spanish Islamic architecture. Until not that many years ago it lay mostly in ruins but over the last several decades the building has been beautifully restored. And interestingly today, the Aragonese legislature meets in a wing of the building. Mark in Aljafería’s throne room. That ceiling was damned impressive. Part of the city’s attraction for me was the Ebro River. They’ve built great walking/biking/running trails along both banks of the river, just inviting you down to enjoy it. As I would follow the river eastbound just a mile-and-a-half from the center of the city, suddenly you were out in the country on a little dirt road, just a great change from urban life. Cities were built on rivers, of course, for the transportation and trade opportunities but these days I love a city that has embraced its river for more pedestrian purposes. Another great part of the city was Parque Grande, a huge public park maybe a mile-and-a-half south of the city center. The park has everything, including big fountains, long walkways, big hills and trees and just everything you could want in a park. One of the higher, more remote areas became my favorite afternoon reading spots. 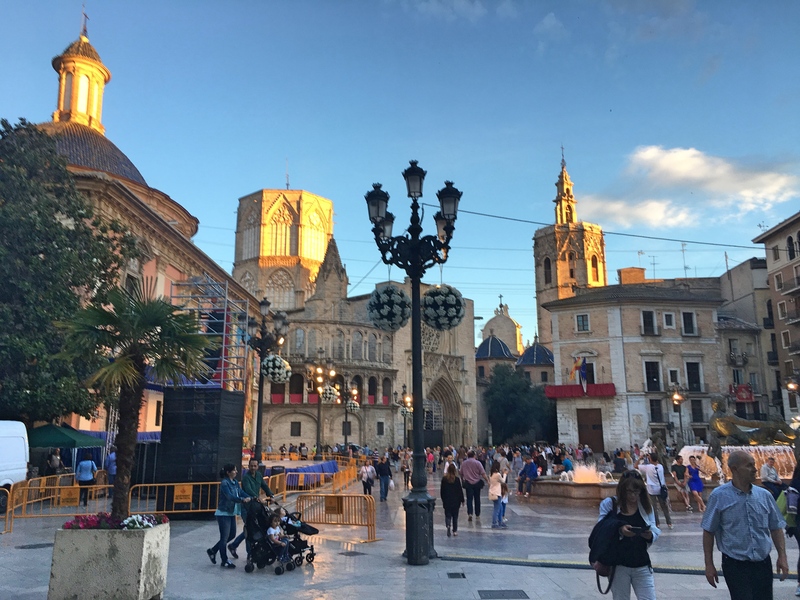 As mentioned above, the city’s many plazas and squares were a big part of the joy of Zaragoza. I spent decades of my life wondering who these people were who could just sit at cafés sipping coffee, whiling away the hours, while I was always too busy. Well, now I’ve become one of them (minus the coffee) and I rather enjoy it. Finally, the city’s Roman ruins – a theater, the remains of the Forum, public baths, and even the city’s river port – are allegedly part of the city’s attraction. Maybe I’m just spoiled but the ruins were really modest. As Mark put it after touring the Forum, they were the kind of ruins that make you hate touring ruins. So OK, no city is perfect. Not perfect, no, but Zaragoza was really nice. Very pleasant. Now it’s on to Barcelona, a city we know based on plenty of experience that we will love. 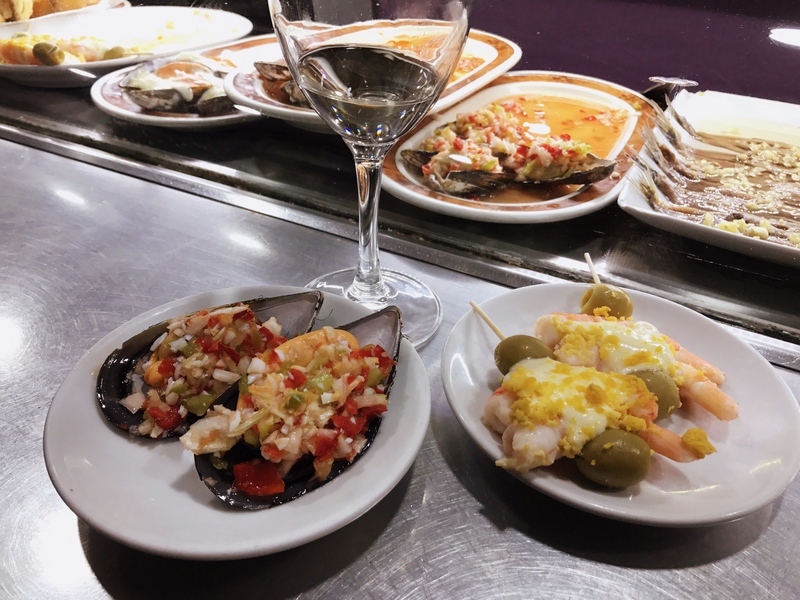 Not surprisingly, we continue to love Spanish tapas. And Spanish wine. Built in the 16th century as a trading exchange, today La Lonja is used for temporary art exhibits. The show we saw was nice, a local Zaragozan artist, but the architecture was the real star. 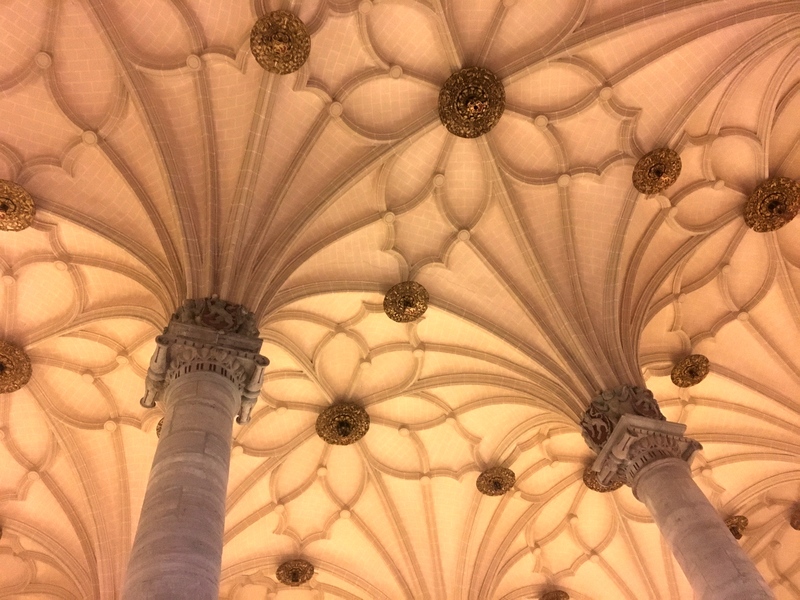 This is a shot of soaring columns reaching up to the ceiling. 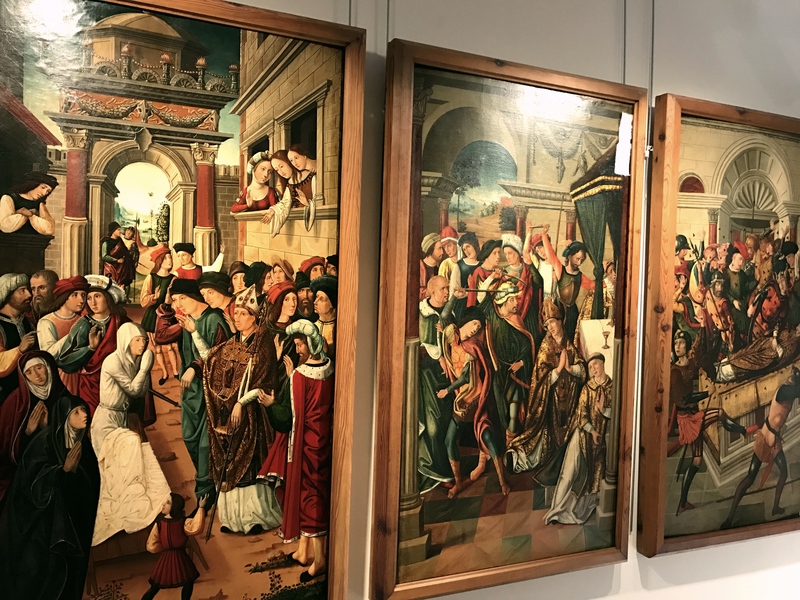 The Museo de Zaragoza includes both archeology and fine arts. Inexplicably, the rooms holding 15 Goyas was closed the day I was there – dark and roped off, though the art was definitely there – but the rest of the museum was still interesting. 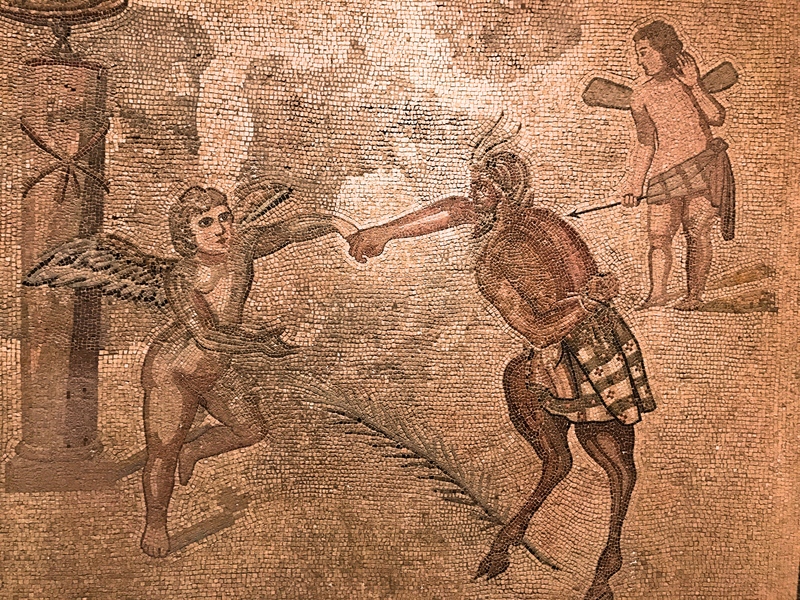 This ancient mosaic is titled Eros and Pan and appears to be the first fist bump in recorded history. A temporary exhibit in the Museo de Zaragoza was work from a Japanese ukiyo-e artist, Utagawa Hiroshige. Mark took one look at my pictures and realized that this was the same guy whose exhibit we’d seen at the Boston Museum of Fine Arts in Nagoya. I’d been so annoyed about the absence of MFA pieces that I hadn’t appreciated his work. This time I did. From Valéncia (both the city and the state) it was off to Aragon, another of Spain’s 17 “autonomous communities” or effectively states. This one, though, has special appeal based on its history. Back in 1469 when King Ferdinand II of Aragon married Queen Isabella of Castile, they united two of the ancient Spanish kingdoms to form the nucleus of what would become modern Spain. You’ve probably heard of Ferdinand & Isabella, the royals who sponsored Christopher Columbus. Interestingly, though, they probably thought 1492 was an important year for a very different reason: it was the year they finally defeated the Moors of Granada, the last of the Moslem rulers in Spain thus completing the Christian reconquest. And if that wasn’t enough for one year it was also the year when, needing money to finance all this exploration and conquest, they expelled the Jews from Spain. It’s worth noting that Ferdinand & Isabella had some pretty important descendants as well. Their daughter Catherine – Catherine of Aragon as she was known – was Henry VIII’s first wife. You know that story. When Henry tired of her he tried to get an annulment from the Pope (she’d briefly been married to Henry’s late brother, though she claimed that marriage had never been consummated). And when that failed Henry broke from the Roman Catholic Church. Kind of a big story. In other words, Aragon was a big deal. The first stop was Teruel a nice little city of about 35,000 people some 90 miles northwest of Valencia. 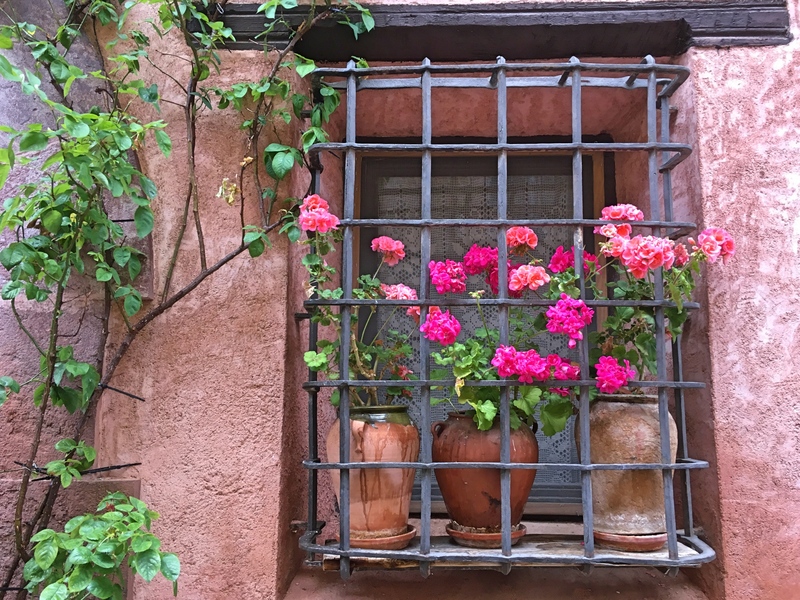 Teruel’s big claim to fame is the stunning Mudéjar architecture. What the hell is that, I wondered. Well, mudéjar is the name given to the Spanish Moslems who remained in Spain, without converting, after the reconquest. 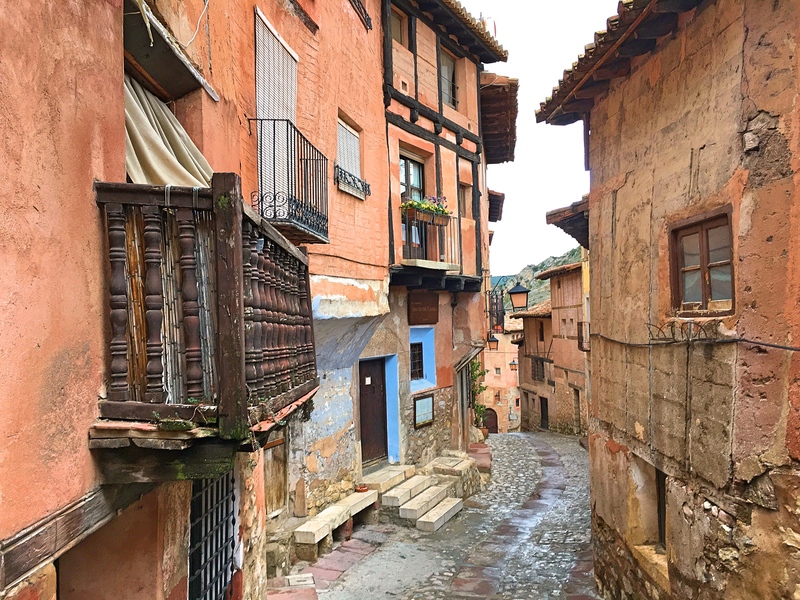 The architectural result is a beautiful blend of Spanish and Islamic artistry in many of the buildings that remain from the Middle Ages and later; collectively, the Mudéjar Architecture of Aragon is listed as a UNESCO World Heritage site. 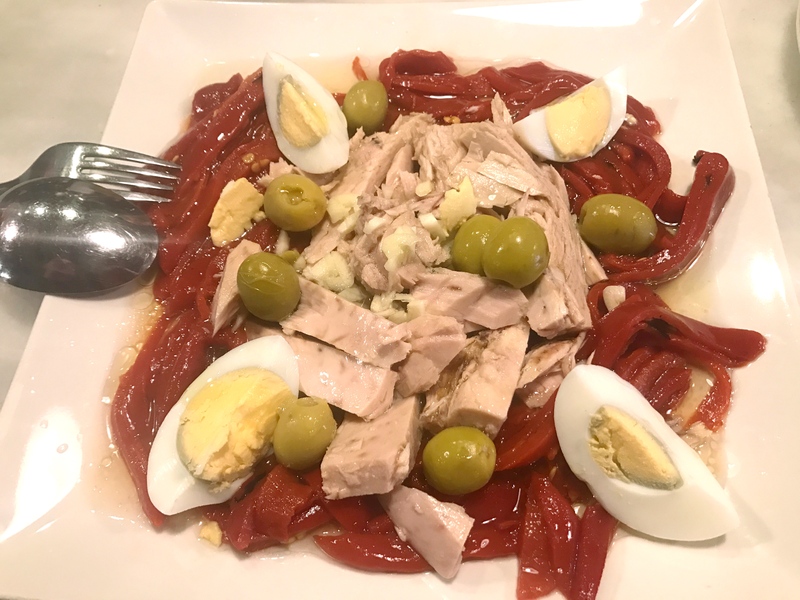 We spent two days in Teruel and I quite enjoyed it. 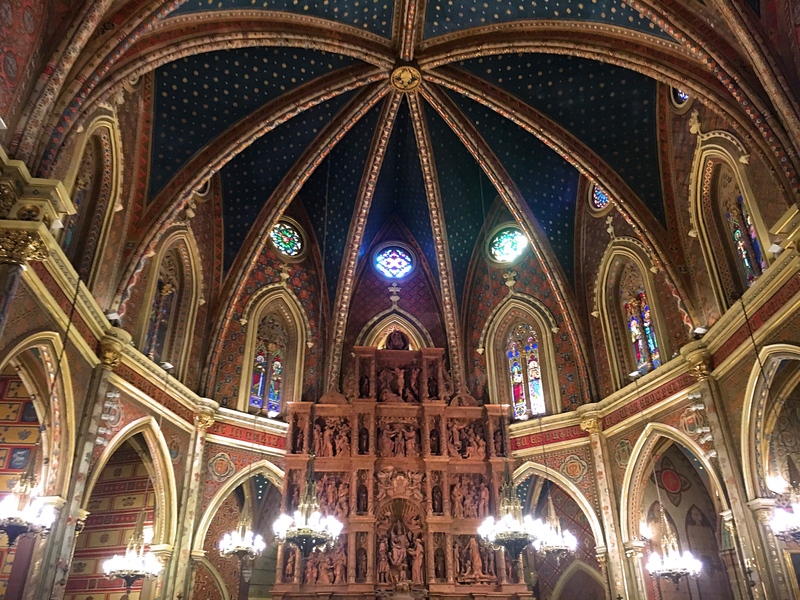 The number of things to do there is pretty limited; the Cathedral takes 15 minutes to see, there’s a tower to climb and a small museum to enjoy. For me there were two things about Teruel that I loved: admiring the unique architecture and long walks in the country. As such a small town it was easy to get out of town quickly and just walk (or run, in the morning) along very quiet roads. 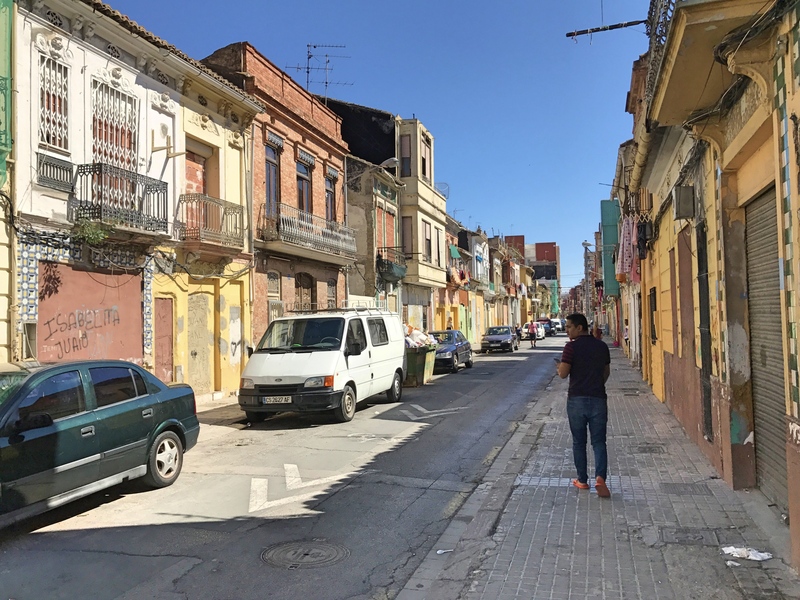 At one point, looking at Google Maps I realized that the two little streams that flowed together where I was walking along was the very start of the Turia River, the river that had been rerouted down in Valencia. Down there it was a big, dangerous river but up here it was a tiny stream. 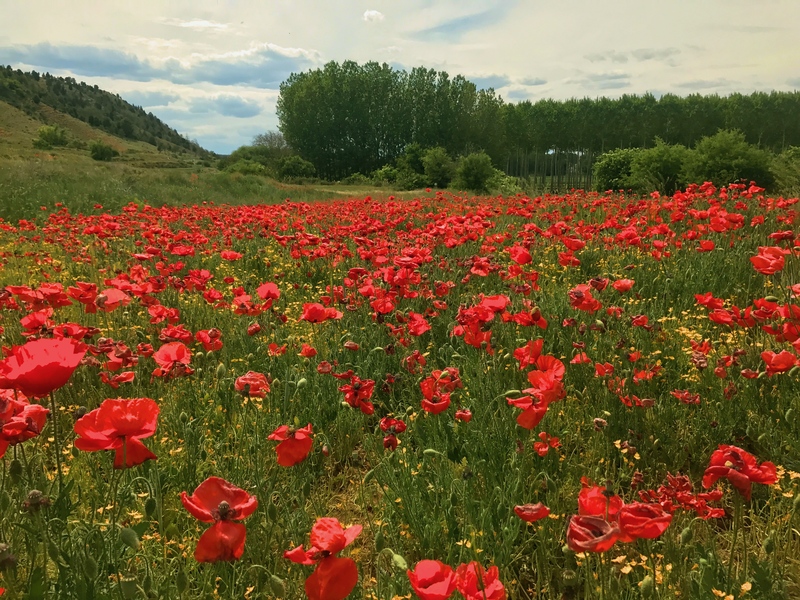 Out for a walk and I come across this poppy field. I was tempted to lie down for a nap, but as I recall from the Wizard of Oz that doesn’t always work out so well. Unfortunately Mark doesn’t like long country walks as much, so he wasn’t quite as keen on Teruel as I was. I’m sure he would say that he liked it, but not as much as I did. And all that wasn’t helped when we discovered that the two restaurants we identified in TripAdvisor as the places we would like to eat were both closed on both days we were there. Terrible. 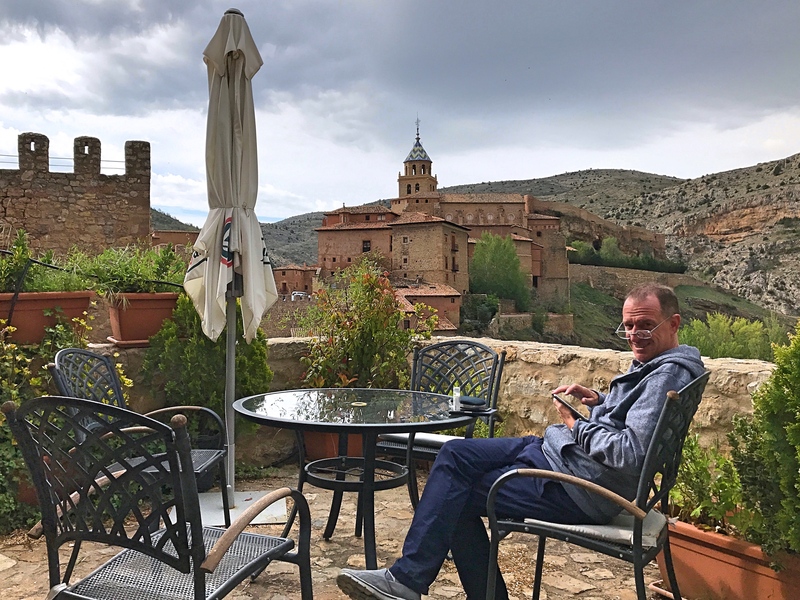 Then it was a short bus ride just 25 miles or so to the tiny town of Albarracín, population 1,100. The attraction here is mostly the town itself and the old buildings lining the meandering streets. 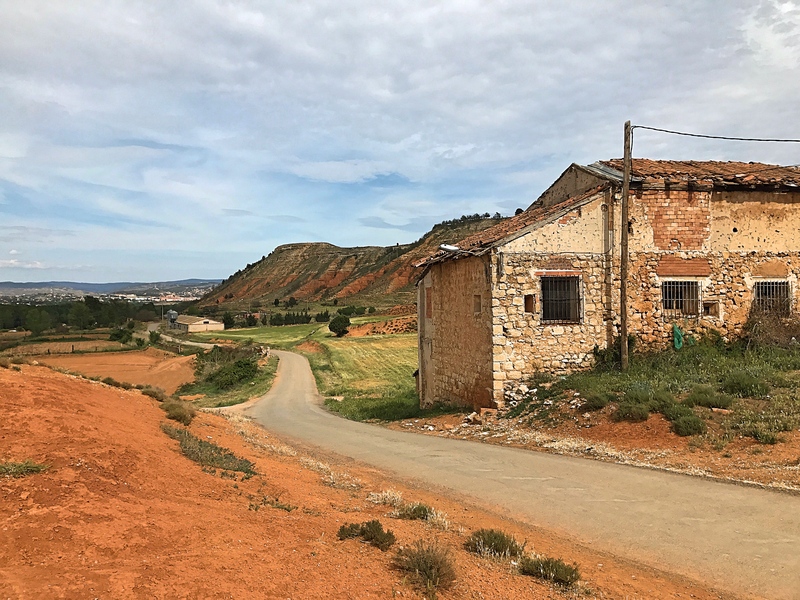 The town exists on a steep outcrop above a valley carved out by the River Guadalaviar, with ancient walls and a tower protecting it from invasion. Well, sort of protecting it. 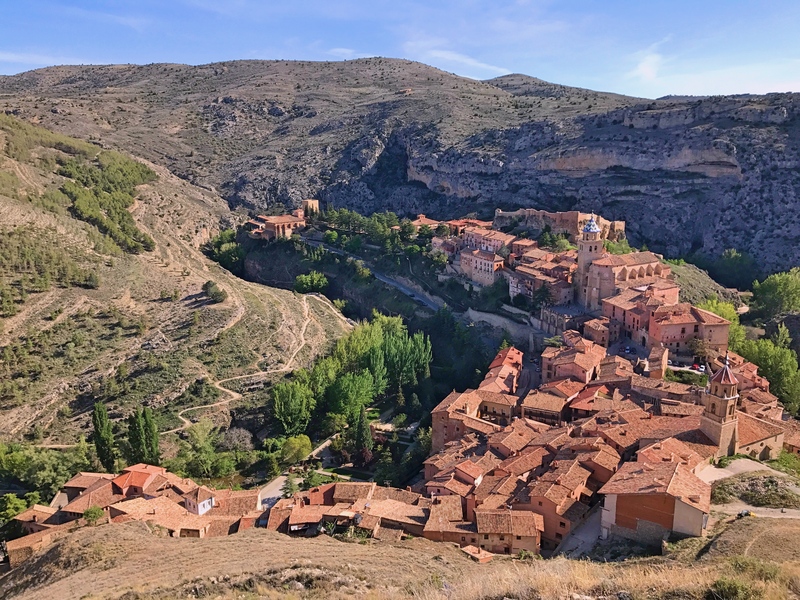 Though Albarracín was an independent kingdom for most of the 13th century, it was eventually defeated by and incorporated into Aragon. 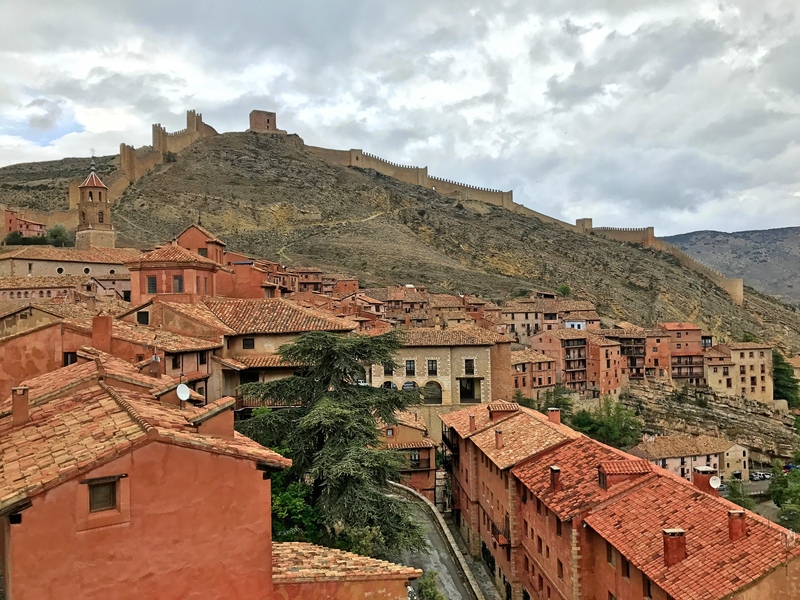 A bit of the town of Albarracín along with the protecting walls and the Walkway Tower looming over all of it. The tower dates from the 9th century while the walls are a more modern 11th or 12th century construction. And a view of Albarracín from up at the Walkway Tower. You can see how the river has carved out a valley with the town just jutting out. There’s one sort of corny, overhyped legend from the town of a rich 13th century girl who fell for a poor 13th century boy. Her father refused his request for her hand as he was poor, so he joined the military to make his fortune with a promise that she would wait five years for his return. His military career was apparently more successful than mine, since just more than five years later he returned a wealthy young man. Unfortunately her father had married her off by then and, when she refused him just one kiss, he died of a broken heart. When she went to his funeral the next day she collapsed on his coffin, kissed his corpse, and proceeded to die as well. 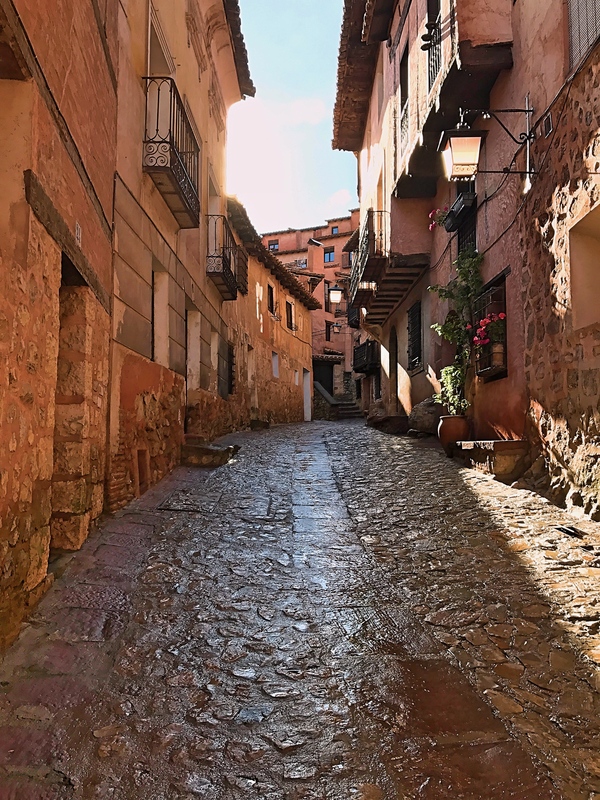 True or not (not), the story is a big deal in Albarracín and there’s a museum and statues and all sorts of references to it around town. 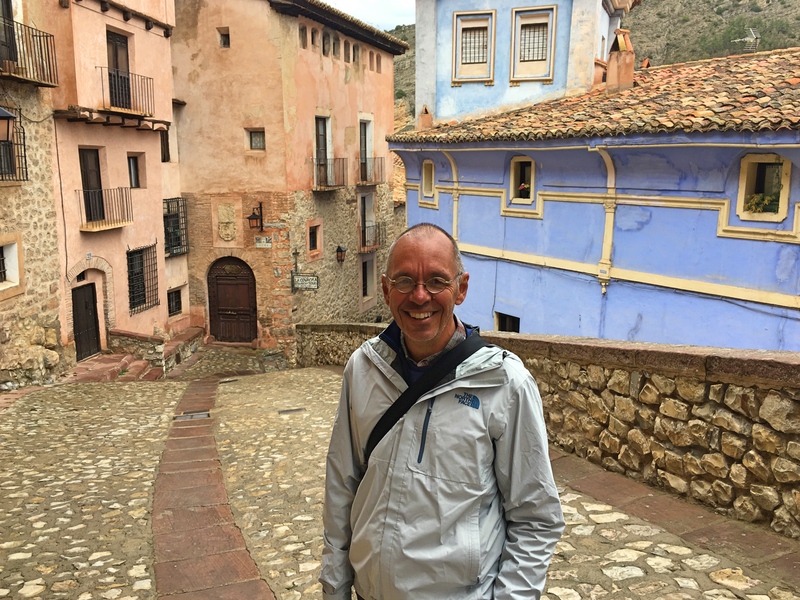 Otherwise there really wasn’t much to do in Albarracín except those long country walks that I love. Most of the modest sites in town – a castle, a cathedral, a museum – require you to tour with a guide and we pretty much hate touring with guides. So we just hung out. And oddly, though there are a number of restaurants in the city, they were almost all closed the entire two days we were there. No signs indicating days or hours just … closed up tight. 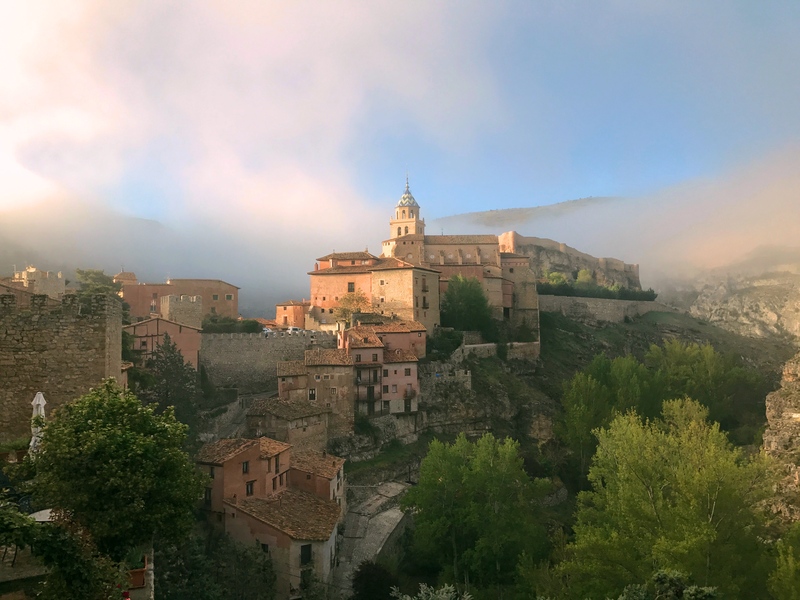 The other strange thing about Albarracín was the weather. The first day was just fine but the second – holy cow. Cold and overcast. Then a cold rain. Then, just as we were heading home after lunch, a hail storm. The rest of the afternoon was bizarre. Big thunderstorms then sunshine followed by rain, more thunder, more sunshine, more rain. And on and on. 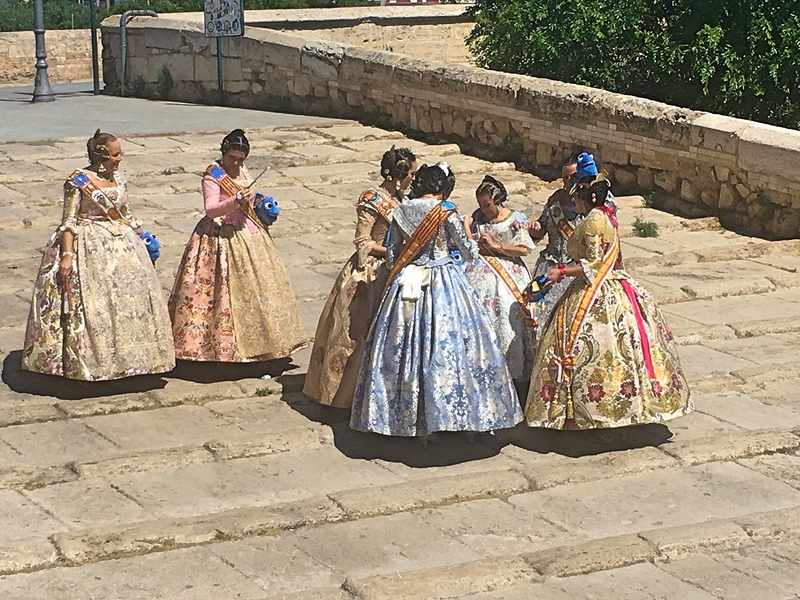 OK, four days was enough to experience small-town Aragon. Next stop Zaragoza, Aragon’s capital. More country roads. That’s Teruel way off in the distance. Here I am at the top of the top of the Tower of El Salvador. The next day the weather turned nasty but it was beautiful on our first day. Coming to a new place like this you never know what you’re going to find. 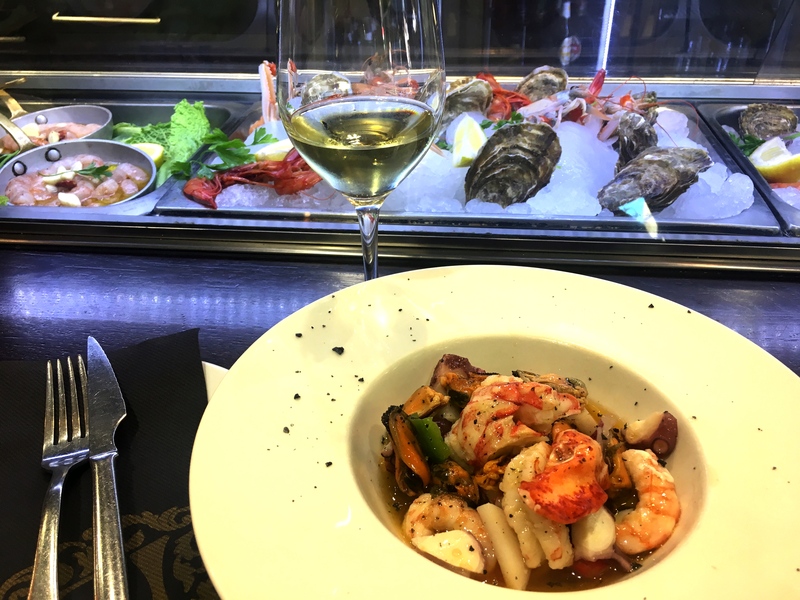 In this case, we absolutely loved València. Loved it, as in could almost imagine living there some day. 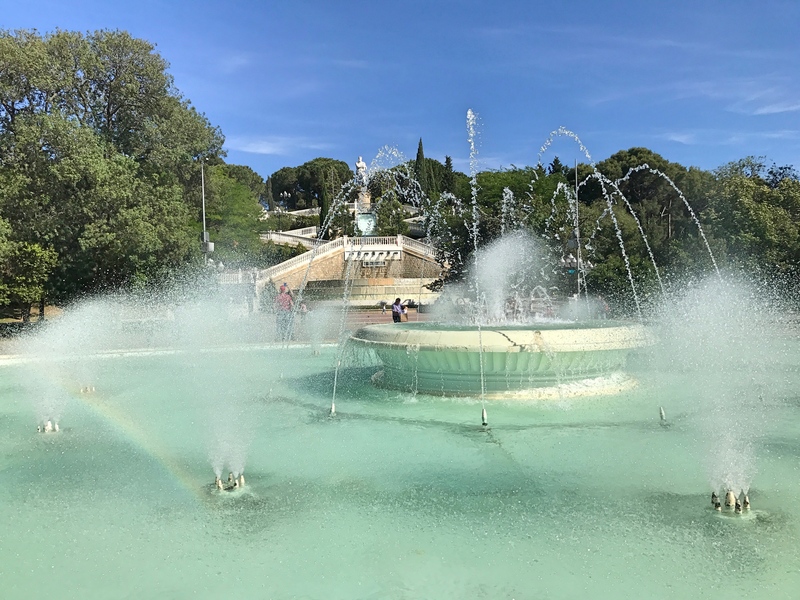 Great architecture, great food, an incredible park, perfect weather, access to the Mediterranean, and all at a fraction of the cost of, say, Paris, where we’d just come from. Part of why it was so perfect had to be the season. The mornings would start cool and then temperatures would climb through the 70s through the early afternoon. This must be just about the perfect time to be here; I can imagine that in July it would get a little hot. But mid-May? Perfect early summer weather, especially after all the cool rain we had in Paris and even Japan. 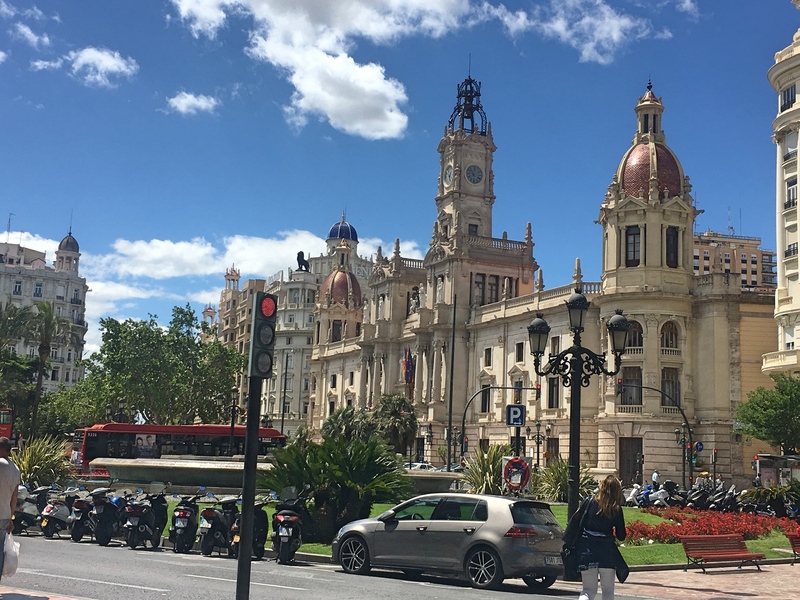 València is Spain’s third-biggest city after and capital of the “autonomous community” – essentially a state – of València, the latter about the size of New Jersey. 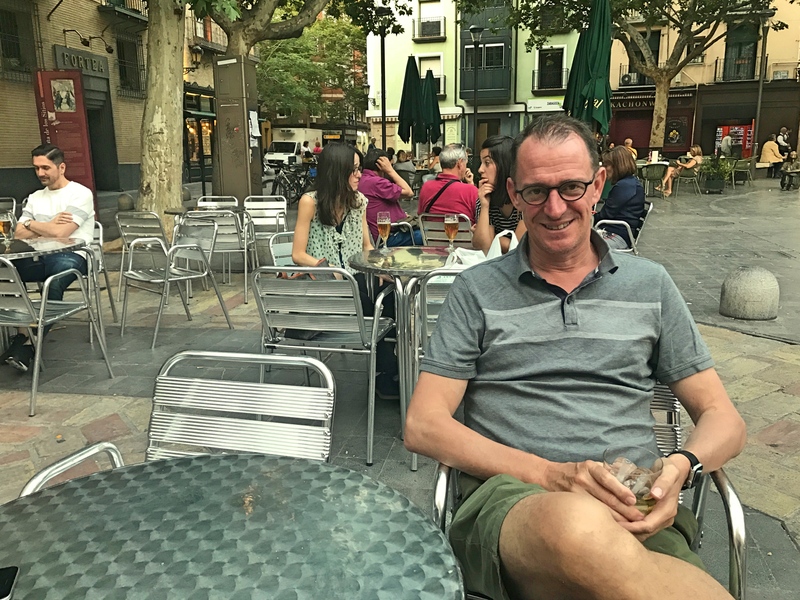 From my perspective there are two important dates in València’s history. The first was in 138 BC when it was founded by Roman soldiers who’d been pensioned off. After that a lot of stuff happened and it was even the Spanish republican capital in 1936 and 1937 during the Spanish Civil War. When Franco then defeated the republicans, València was punished under his rule. The next big date (again, this is a very personal history) was in 1957 when the Rio Turia, which runs through ran through the city, flooded. Again. This time the city leaders decided they’d had enough and chose to move the river. Seriously. At the western end of the city, where the river once entered, they diverted it and sent it southward more directly to the Mediterranean and avoiding the city. 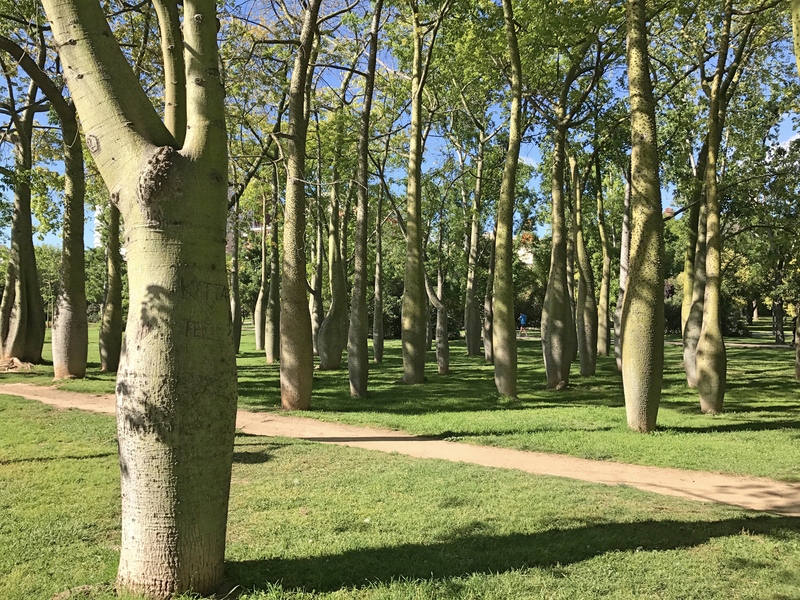 The cool thing about that project is that what was once the riverbed running through València is now a remarkable green space consisting of a huge variety of soccer fields, running tracks, bike trails, basketball courts, exercise stations, walking trails and on and on. Traffic moves above the parkway on bridges constructed long before the diversion project (some dating back several hundred years) making it one of the most amazing public green spaces I’ve ever seen. And on top of all that, near the end of the parkway, what used to be down river, local-boy-made-good international architectural star Santiago Calatrava designed the City of Arts and Sciences. 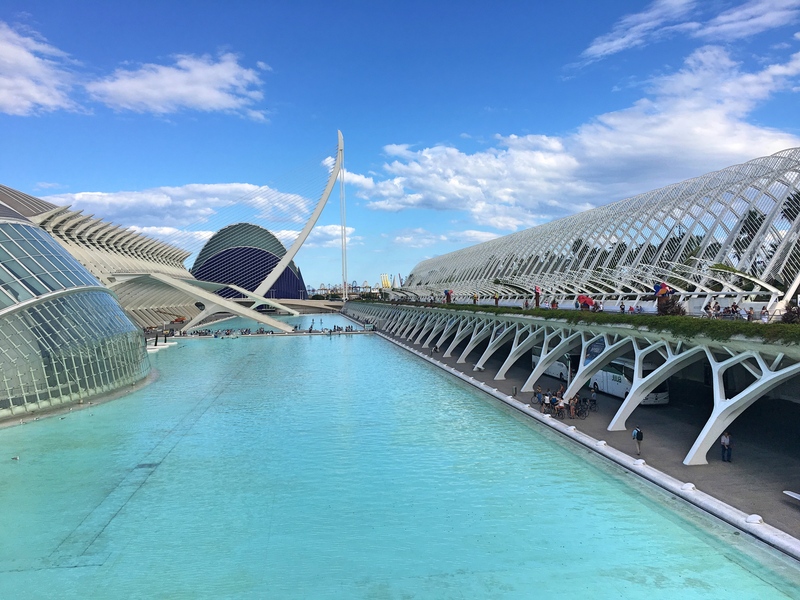 This is a modern architectural fantasy land with museums and opera halls, walkways and water features, an IMAX theater, an oceanographic aquarium, and perhaps the most beautiful bridge I’ve ever seen. The whole thing has cost more than three times its original estimate (shades of Boston’s Big Dig), but if you weren’t paying Valèncian taxes it is stunning. And so once again, after years of travel all over the world, we discover something we’ve never seen before: a massive public park built into an old riverbed. It got me wondering why other cities don’t think of this. Paris could move the Seine, or Minneapolis could divert the Mississippi, and *boom! * great opportunities for parkland. OK, maybe that’s not likely, but in València it worked pretty well. That was València. A gorgeous and atmospheric old city surrounded by ancient towers that once formed parts of the city walls. A beautiful 15th century silk trading house that is now a UNESCO World Heritage site. 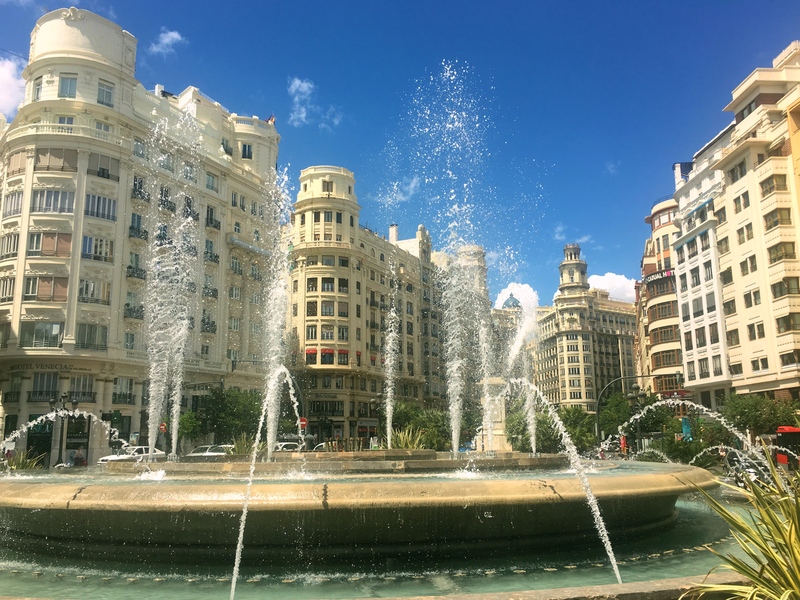 Beautiful 19th century Spanish architecture along with some stunning modern buildings. A nice free art museum – my favorite entrance fee – great tapas, and in case I didn’t mention it, perfect weather. 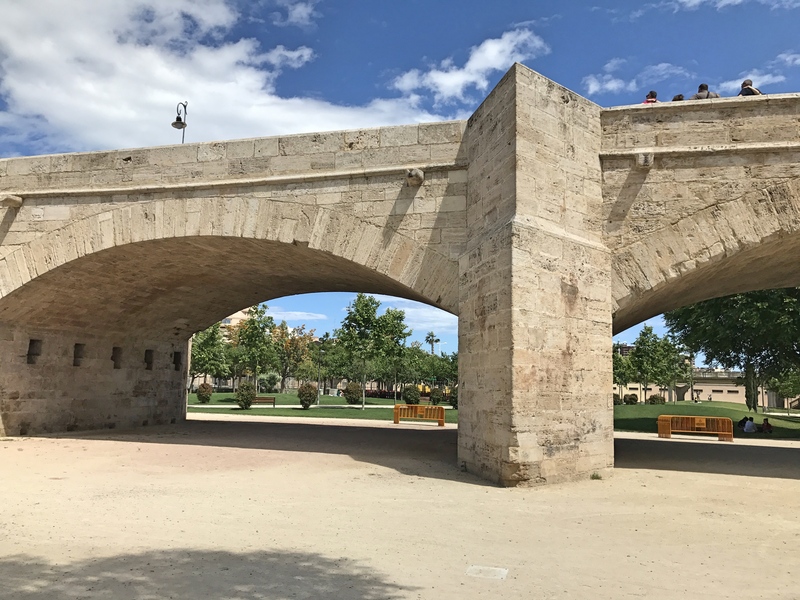 A 16th century bridge spanning what was once the Turia River. All these bridges mean that for miles of parkland runners, walkers, and bikers never have to contend with traffic. It’s remarkable. 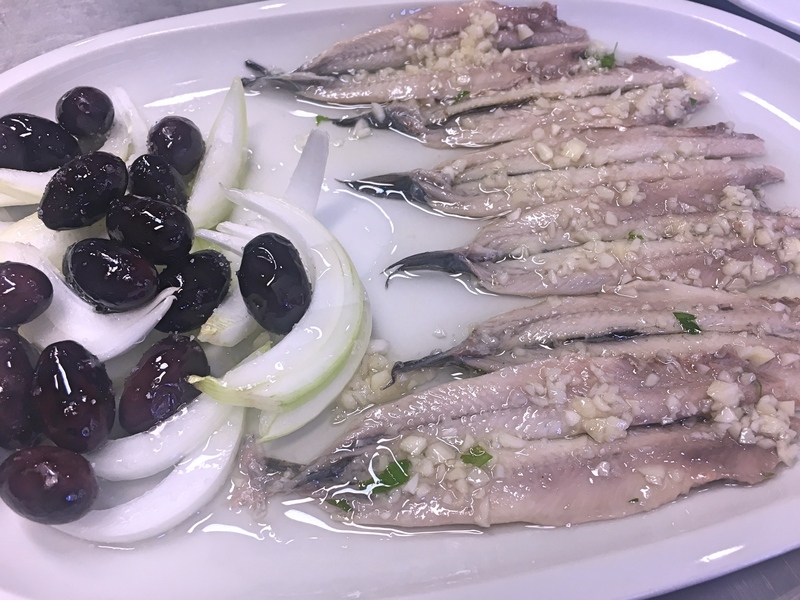 The food of València was darned good. 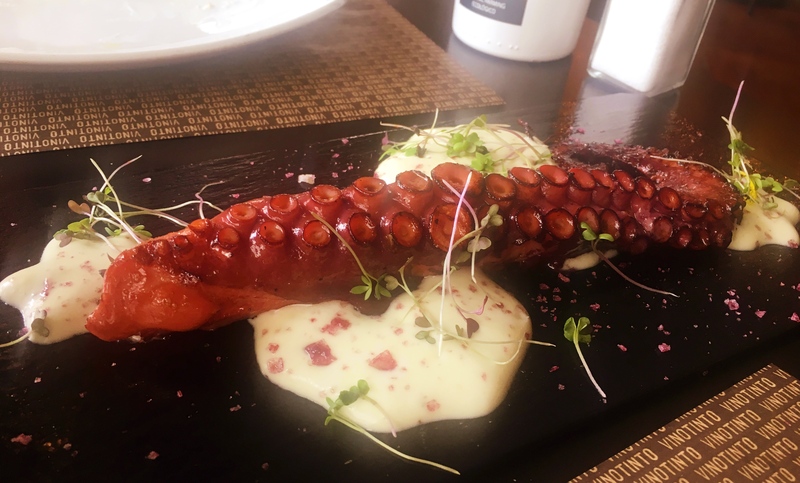 This was a lunch Mark had at a tapas bar while I was at the beach on the Mediterranean. Unfortunately for me every single restaurant along the beach that day was fully booked. Every one. So my lunch consisted of a bottle of water. I was, however, on a Mediterranean beach so I really wasn’t complaining that much. You don’t want to miss this one. 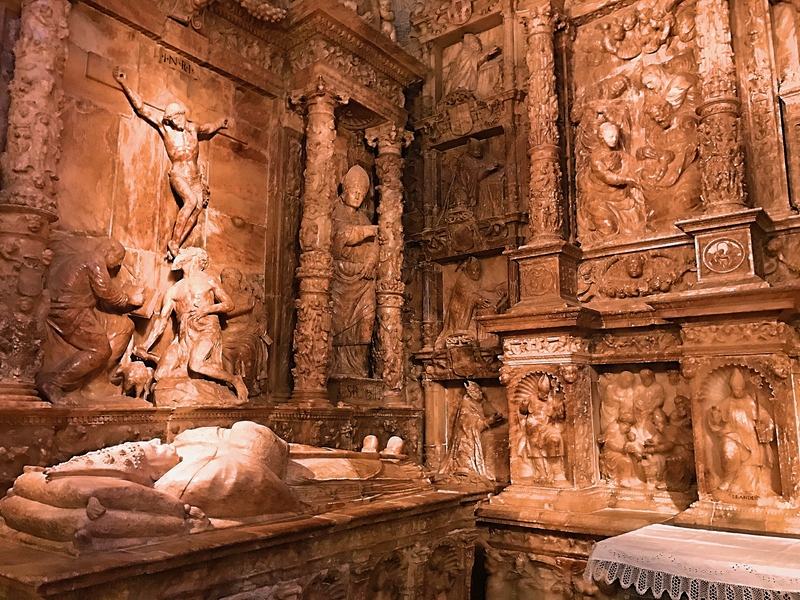 In València’s cathedral is a special chapel that holds – you won’t believe this – the Holy Grail. Yup, the very chalice from which Christ drank at the Last Supper. It has been scientifically dated to the 1st century, so who knows, maybe it’s true. Lest you think the city is perfect, though, here’s a random street I passed on my walk to the beach. Felt more like I was in Mexico or Peru than Europe.